My two year old daughter is addicted to homemade freezer pops. She demands them just about every day since I first introduced her to these fruity frozen treats. It’s a good thing they are so easy to make in the plastic zipper popsicle bags so I can keep the freezer stocked with them. I’ve been reusing the bags by rinsing them out and then putting them in the dishwasher. So far, only one got a hole and needed to be thrown away. I’d say you can get at least 5 uses out of one bag which makes them much more economical than tossing them after one use. The freezer pop addiction started a couple months ago after my first Zipzicle freezer pop bags arrived. The first flavor pops we made were sugar free low carb blueberry lemonade freezer pop popsicles. 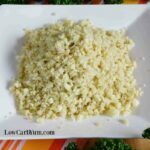 Since then, I have been freezing homemade sugar free lemonade in the bags which is quick and easy. 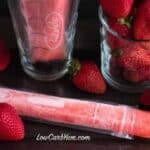 My daughter really loves strawberries so I came up with this strawberry sugar free low carb popsicles freezer pops recipe that will fill about one dozen Zipzicle bags. 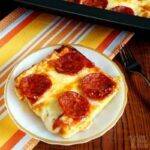 This recipe is pretty easy. 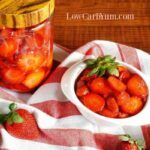 You’ll need about 2 cups of strawberries to make a sweetened strawberry syrup. I heated the strawberries with low carb stevia and erythritol sweeteners. 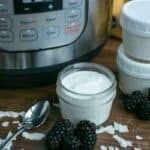 Cooking the fruit helps release the juices. 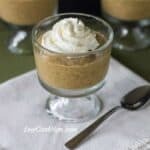 After letting the syrup cool down a bit, I poured it in a small blender. 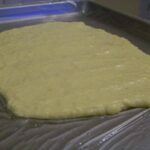 A stick blender could also be used right in the pan. 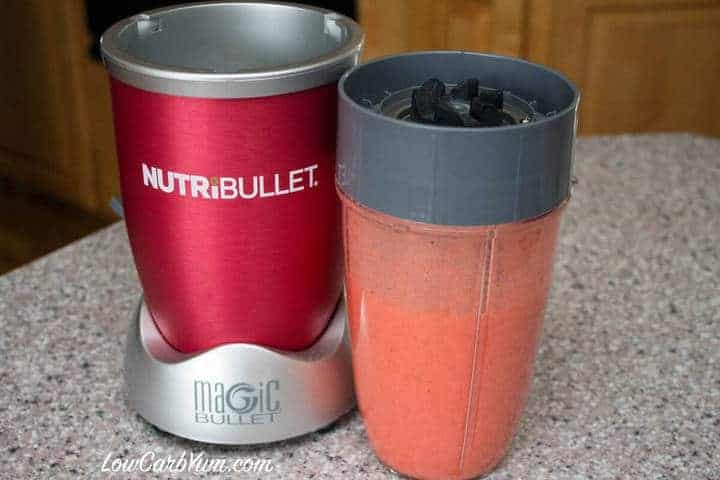 I blended just until all the strawberries were broken up and a thick liquid formed. It was pretty frothy at this point. 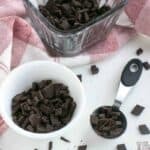 Although it’s recommended to use a funnel to fill the narrow popsicle bags, I found that pouring from a OXO measuring cup is just as good if not better. 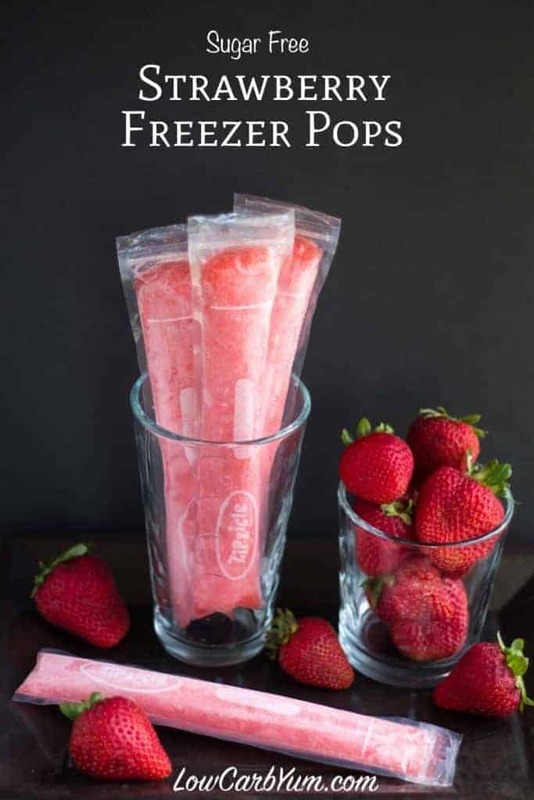 These strawberry freezer pop popsicles are similar to the frozen fruit pops I used to buy that were sweetened with juice. Regular popsicles are too messy for my two year old right now. So, I’ll stick with giving her the homemade pops in the zipper bags which keeps the drips inside the bag. 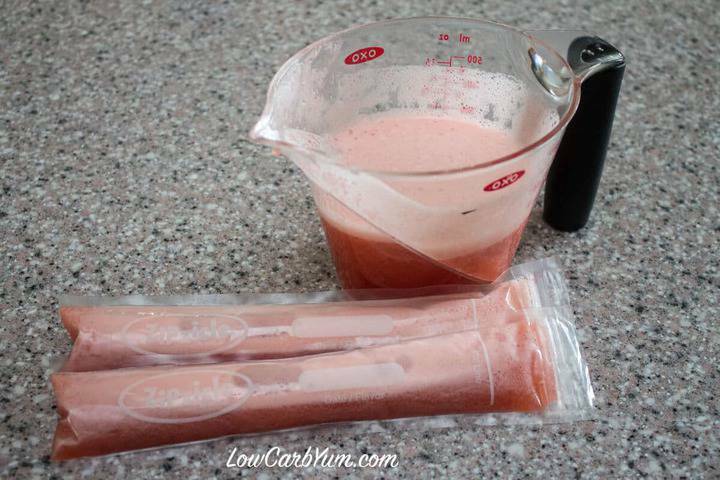 An easy low carb strawberry freezer pops fruit popsicles recipe sweetened with stevia. 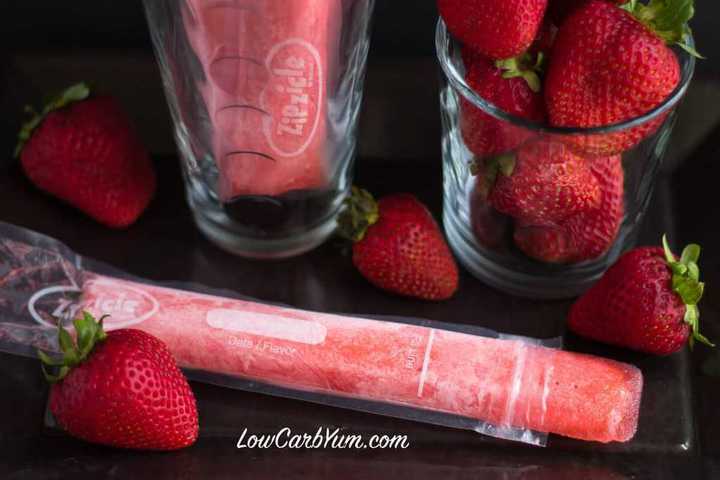 These sugar free strawberry popsicles can be frozen in bags or molds. 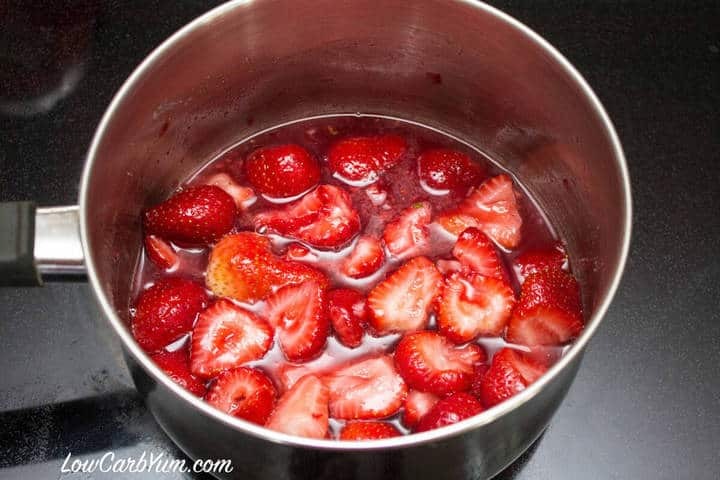 In a saucepan, heat sweetener and strawberries on medium low until a sauce is formed (about 5-10 minutes). 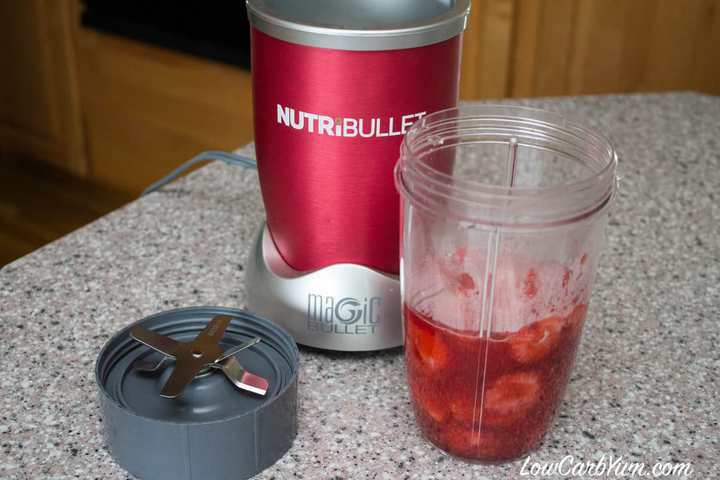 Place warm strawberry sauce and lemon juice in blender until smooth. 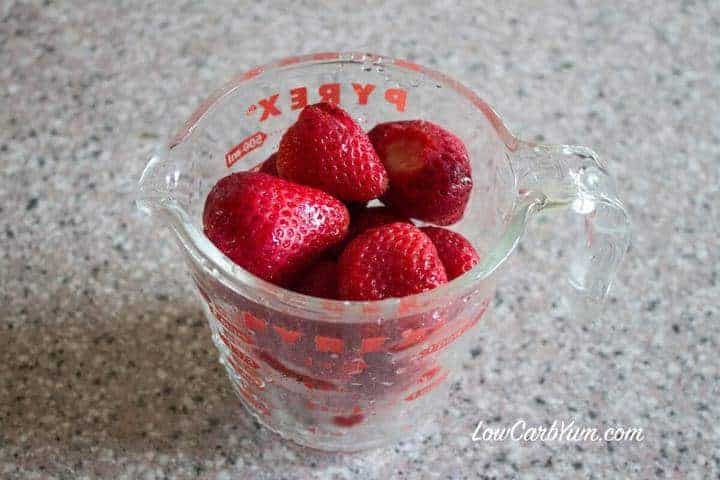 Combine with water in large bowl. 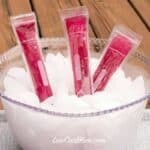 Pour liquid into popsicle molds or freezer pop bags. 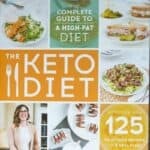 Nutrition does not include erythritol as it depends on sweetener used. 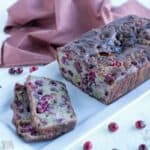 More sweetener may be needed depending on sweetness of strawberries used.